Various activities like identifying colours, alphabets, fruits, vegetables etc are taught by colouring the diagrams on the classroom walls, such that it gives a sufficient space for every child to internalise whatever is taught at school. Air conditioned classrooms to see that their learning process is not interrupted due to suffocation heat or sweating. LEAD School Academy System comes with range of material that helps the students to stand apart from the crowd. A combination of Teacher Manual, Workbook and textbook ensures that every concept is delivered with utmost care. Collaboration with LEAD School Academy System is of great help, as this comes with lot of activity oriented learning which makes children stay active and teach them the importance of questioning and art of raising earnest enquiries. 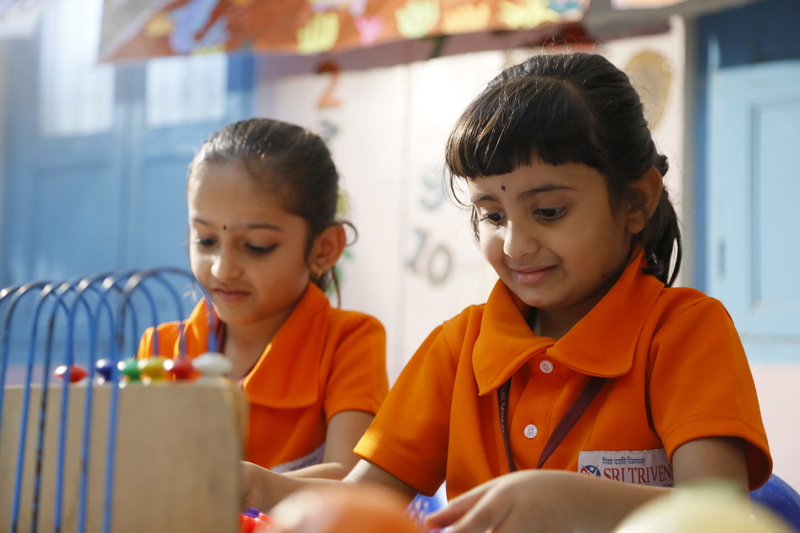 Transforming their thoughts into structured expressions, inculcating value systems and self discipline and creating an excitement in self learning are the core principles under this curriculum. This is the time students need to consolidate their basics and reorient themselves towards application of the knowledge or subject they are taught in the classroom. Thisapplication orientation is what helps them to stand apart from the crowd at any point of time in their life. Knowledge without application is like having a Diamond but no idea of what to do with it. To ensure that the syllabus taught and the way it is taught, to our children is competent enough to prepare for various competitive examinations; we are going in line with integrated curriculum structure where the best of the features available in SSC and CBSE are brought under one roof. There by helping the student to excel in all the directions. With all our efforts at SRI TRIVENI, we have been highly successful in producing the desired result s. Our students are leaving a strong footprint wherever they are, be it academics, sports, co-curriculum activies, competitive exams and their professions.